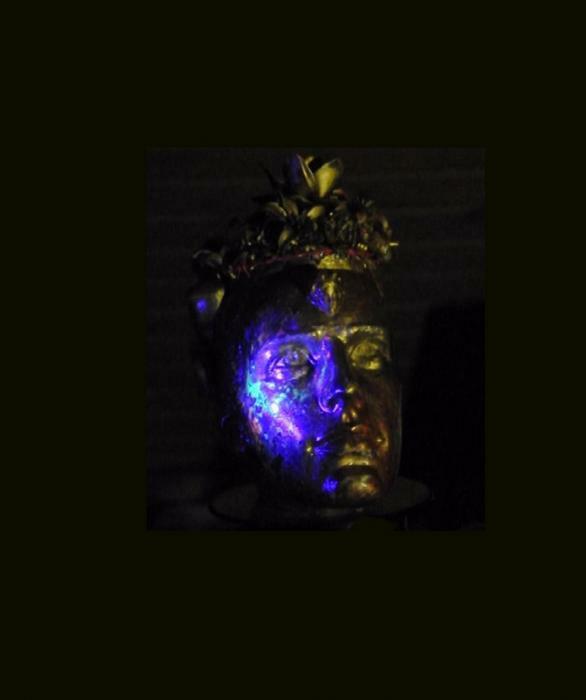 It is a turning head with a normal led light at one sight and on the other side with blacklight. Under the gold, I first edit it with different Fluorescent colors. After I sprayed it very light gold. Because of the turning, de colours are changing frequently. Also you can see the underlying fluorescent colours and scratches because of the blacklight. It is telling a story of all your dreams en who you would like to be. One time you would like to be that person and another periode you wanna be somebody else. One time you'd wanna be tough and manly, the other time sweet and more femalelike. Yet growth only comes through pain and struggle. Therfore the scratches.